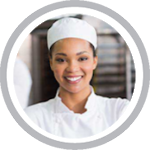 Indiana food handler safety training is necessary for employees in the food service and hospitality industry. Indiana food safety training is for employees (such as chefs, cooks, servers, preparers, vendors, caterers, supervisors and managers) who are involved in preparing, storing, or handling food that work in: (restaurants, bars, cafes, bakeries, delis, mobile food trucks, assisted-living, day care centers, and convenience stores). The Indiana Food Handler Training Course is online, easy to use and takes about 2 hours to complete. The course is ANSI-accredited, state-approved and will take you step-by-step through everything you need to know, including food safety definitions, safe hygienic practices, safe food temperatures, cross-contamination of food, and food-related illnesses. All food safety content materials and exams are available in both English and Spanish. Start now and get one step closer to obtaining your Indiana food handler’s training card! Marion County – Department of Public Health – Food and Consumer Safety (Website) – The Department of Food and Consumer Safety licenses and inspects retail food establishments and temporary food establishments, responds to consumer complaints and provides food safety education. We offer online Food Safety Training in Indiana for: Indianapolis, Fort Wayne, Evansville, South Bend, Carmel, Bloomington, Fishers, Hammond, Gary, Muncie, Lafayette, Terre Haute, Kokomo, Noblesville, Anderson, Greenwood, Columbus, and many more! Getting your Indiana Food Handlers Training couldn’t be easier!